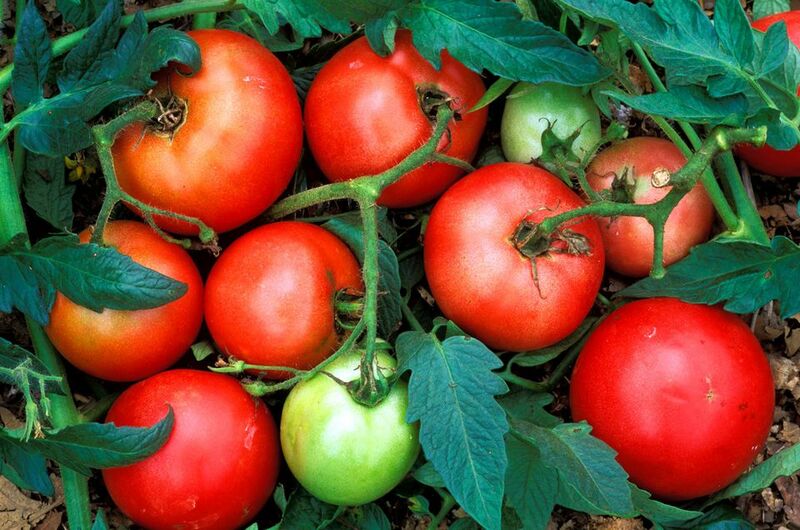 No other vegetable or fruit is more widely used nor consumed than the tomato. From pizza to ketchup to sun-dried tomatoes and all in between, the tomato has an infinite number of applications on the dinner table. They can even be candied and used in cakes. are a popular Southern dish. • A good serrated knife is far superior to a flat-edged knife for slicing tomatoes. If you use a flat-edged knife, be certain it is very sharp or you will squash and bruise the tomato flesh when slicing. • Scooped-out cherry tomatoes make great edible cups for fish or egg salad, herbed cheese, or as an appetizer. Use a standard-sized hollowed tomato filled with any variety of stuffings as a side dish, either baked, raw or as a condiment bowl for sauces. Turn the hollowed out tomatoes upside down to drain for about ten minutes before filling. When baking stuffed tomatoes, place them in a muffin tin for stability. • If your tomatoes seem overly acidic, you can add a sprinkle of sugar and salt, both of which will bring out the flavor. • Rather than sugar, I prefer adding grated carrot to marinara sauce to combat acidity. The carrot disintegrates in the sauce and adds sweetness but no hint of carrot flavor. • When making a tomato sauce, a quarter teaspoon of baking soda per gallon will also help alleviate acidity. • The high acid content of the tomato will naturally slow down the cooking process of some other foods. For example, beans cooked with tomatoes added may take up to twenty percent more cooking time than without. • Plum tomatoes are best used for sauces. Globe, cherry, and grape tomatoes are best for eating raw, although all varieties are good. • If your only choice is the mealy, tasteless supermarket fresh tomato, you may well be better off using canned tomatoes in cooked recipes. • Herbs that marry wonderfully with tomatoes include basil, oregano, marjoram, pepper, dill weed, thyme, garlic, bay leaf, celery seed, sesame seed, tarragon, chives, and parsley. • If you happen to be the unfortunate victim of the wrong end of a skunk, tomato juice will neutralize butyl mercaptan, the prime ingredient in the skunk's stinky defensive spray.